When it comes to great beaches, you’re spoiled for choice in Sardinia, the large island off Italy’s western coast. But with its sparkling water, powder-white sand and lush Mediterranean vegetation, the beach at Su Turiarzu has to be one of Sardinia’s best. And don’t just take our word for it: The beach recently received the “Five Sails Award” from Italy’s environmental association Legambiente and the Touring Club’s “Guida Blu.” It’s also rated as the best beach in Italy for its water quality and environmentally-friendly initiatives.Situated in the medieval town of Posada on the east coast of Sardinia, it is easily accessible and thanks to its shallow waters, an ideal spot for families with children. While here, don’t forget to soak in the rich history and culture of one of the oldest towns on the island. You'll rarely hear an English word spoken on Tuscany's long and varied coastline, since most travelers are drawn to its incomparable cities. But the beaches happen to be close to some less-visited but well-preserved villages with rich archaeological sites. San Domino is the greener of the three Tremeti Islands, its pines offering welcome shade from the heat. 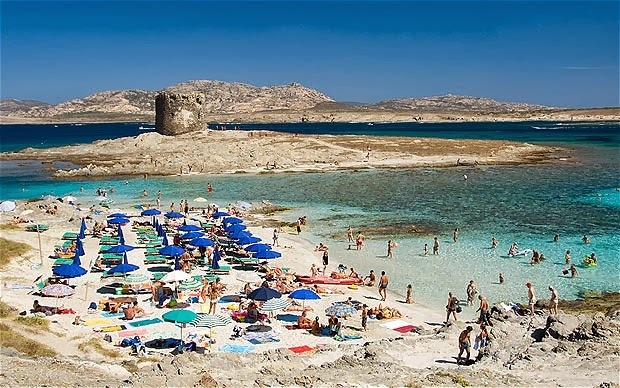 Although there’s a sandy beach – Calla delle Arene – right where the ferry lands, it gets packed in the summer. Instead, follow signs for the Villagio TCI and head for the Calla dello Spido – one of many of the quieter coves in the west of the island. While most visitors to the Amalfi coast’s Positano head to the swanky Spiaggia Grande, in-the-know visitors—especially those in search of peace and quiet—beeline to Fornillo Beach, just a 10-minute walk away. And who says spectacular beaches have to be sandy? Fornillo’s pebbled stones give the beach its charm. And the view of the Amalfi coast’s iconic cliffs, not to mention a Norman tower, make it even more picturesque. Better yet, Fornillo is generally quiet and peaceful… although it can get crowded in summer months.